Every time when I feel an onset of a cold, I put my fluorite bracelets on overnight and I wake up in the morning completely healthy. I wear my fluorite chips necklace every time I travel by airplane (and I’m at the airports too often to count) and/or spend time around large groups of people - and I always stay in great health. Secondly, my job involves working on a lot of projects that include research and writing. I usually enjoy this, but there are times when I don’t feel like even looking at words, let alone writing them! At those times I reach for my fluorites (I put them in my pockets, in my lap, next to the computer), I blink, and suddenly it’s three hours later and my project is complete! I get totally engrossed in the work and don’t even notice that the time has passed by. This just happened again this afternoon! The best part is that the quality of my work is very good. I feel that my thoughts are very well organized and that I am able to express myself clearly; responding appropriately to what the situation or task requires with a new sense of clarity. Finally, while many people like to meditate and work on increasing their intuitive abilities with fluorite, I have noticed that this crystal also helps with any kind of procrastination. In other words, for me it is an activating crystal. 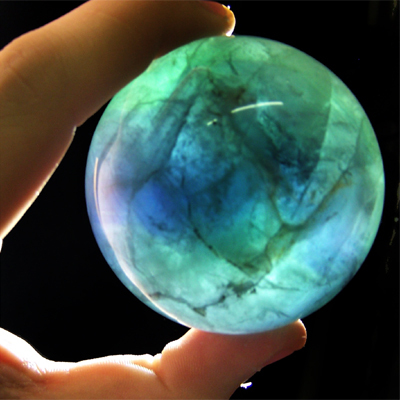 Any work that you dread starting becomes easier when wearing fluorite. The funny thing is that it always catches me by surprise - I only notice its effect after the work has been done! Working kind of sneaks up on you when you are wearing fluorite (which is sometimes a plus). It also helps you to accomplish more things and to do them faster than you ordinarily would. I believe this is why many crystal books suggest having students use fluorite to help with studying. Learning seems somehow easier, and the resistance to new material diminishes, allowing the feeling of being overwhelmed to evaporate. So give fluorite a try and let us know how it works for you! Wishing you health, inspired writing or studying, and a creatively productive day!